While supplying light and fertilizing your aquatic plants are relatively obvious needs of a planted tank, it can be easy to overlook the importance of supplying carbon dioxide. Plants, like animals, need to “breathe.” They do so in different ways, and generally speaking their “breathing” is the reverse of ours. While we breathe in the atmosphere, use the available oxygen, and exhale carbon dioxide, during photosynthesis plants take in the available gases, use carbon dioxide, and release oxygen. The atmosphere is made up of many different gases. Roughly 78% of air is nitrogen, 21% is oxygen, and about .04% carbon dioxide. Water can only hold so much gas, which is determined by its temperature and other materials dissolved into it, and will absorb gases in the same proportion as they are in the atmosphere. Like in the atmosphere, roughly 78% of the gas that has been absorbed in water will be nitrogen, 21% oxygen, and .04% carbon dioxide. If something causes these to change, they will over time even themselves back out. For example, if you put a fish into water, it will breathe in oxygen and breathe out carbon dioxide. This will result in less than 21% oxygen and more than .04% carbon dioxide in the water. Because there is proportionally more oxygen in the atmosphere than in the water, some of the oxygen in the air will be absorbed to replace what was used. Conversely, some of the CO2 in the water will be released into the atmosphere to get back down to .04%. The biggest factor in how quickly gases are absorbed from or lost to the atmosphere is the amount of surface area of the water. A short wide tank with more surface area is going to be able to correct gas imbalances faster than a tall skinny tank. Anything that creates turbulence or stirs up the water, such as splashing from a filter or the air bubbles from an air pump, increases the surface area and speeds up gas exchange, often significantly. What does this mean for our planted tanks? Typically, there are two different forces going on. The fish are consuming oxygen and releasing carbon dioxide while the plants are consuming carbon dioxide while releasing oxygen. Except in extreme cases, the fish in your tank are not going to consume all of the oxygen, so you don’t generally have to worry about supplying more for them. Likewise in a low light tank, where you’re not adding extra nutrients for the plants, the plants are probably not taking in carbon dioxide fast enough to deplete it. In medium and high light tanks, though, when plant growth is accelerated, the carbon dioxide is likely to run out fairly quickly, even with the fish releasing more. If you’re going to be running high lights and adding fertilizers, you need to supply extra carbon dioxide to make up for that. Supplementing the carbon dioxide in your aquarium is one of the new concepts that planted tank keepers need to learn before they can be truly successful. There are a few different methods that can be taken with various degrees of success. There are several products on the market that claim to act as a source of carbon for plants, eliminating the need for any other form of carbon dioxide supplementation. While these can have their uses and certain benefits, when it comes to maximizing plant growth they generally don’t work very well. Some also run the risk of poisoning fish if accidentally overdosed. You can research these products to see if any of the secondary benefits are worth using them, but don’t expect them to replace a true carbon dioxide supplement. Many centuries ago, man discovered that certain forms of yeast will “eat” the sugar in a liquid and change it into alcohol, and thus beer, mead, wine, and countless other intoxicating beverages were created. One side effect of this process is that the yeast also releases carbon dioxide. Somewhere along the way, enterprising aquarists who wanted to save some money decided to harness this power to create a source of carbon dioxide for their plants. And it worked! For a while. 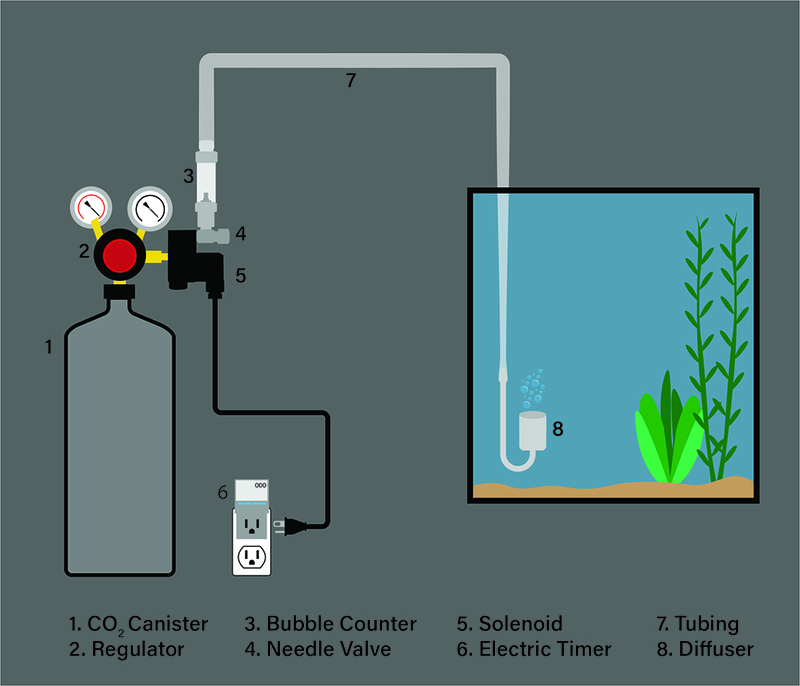 The typical DIY system is created by using a few sturdy bottles, water, sugar, yeast, air tubing, and an air diffuser to get carbon dioxide into the aquarium. To set up a yeast-powered DIY system, mix up a batch of sugar water into a large bottle and add yeast. Run an air tube from the lid of the bottle into another bottle of water, with the end of the tubing under the water (this acts as a filter to prevent accidentally dosing your aquarium with alcohol). 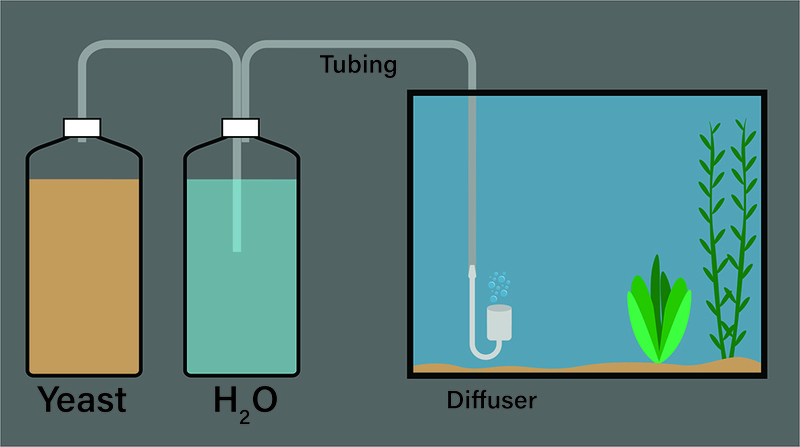 Run a second air tube from the second bottle, into the aquarium, and use an air diffuser (e.g. an air stone) to break the gas bubbles into small pieces. This system works, but it’s not without problems. As the sugar is turned to alcohol, eventually the yeast die from alcohol poisoning. Bread yeast, while the easiest to find, has the lowest tolerance, while beer, wine, and champagne yeasts can survive progressively higher alcohol levels, and thus last for longer before needing to be replaced. Generally speaking, a DIY system will put out a decent supply of carbon dioxide for two to four weeks before needing to be remade. With a DIY system, there is no way to control the amount or timing of the carbon dioxide going to your tank. What the yeast produces is what you get, and it won’t be a stable, steady amount over the life of the setup, which can lead to problems with your plants. It can also be difficult to ensure air tight connections where you put the tubes into the bottles. As planted tanks grow more popular, more aquarium supply manufacturers are making small systems designed to be more of a “plug and play” system, providing more control and stability over the DIY setups. You can find these sorts of setups based off of both compressed air cartridges as well as more manual pressurized spray bottles. Many of the cartridge systems will have some sort of a control mechanism, such as a valve you can turn to release more or less air at a time. The air would then go through an air tube and through some sort of diffuser. Because plants only consume carbon dioxide while going through photosynthesis (i.e. when there is light), you can close the valve at night to conserve the air. Alternatively, some systems come in a bottle similar to an aerosol spray bottle. This connects through an air tube to some sort of holding mechanism where the air “pools,” slowly dissolving into the water. When the bubble of carbon dioxide is mostly dissolved, you just spray more into it. These systems can be relatively effective for small aquariums. You have much more control over them than you do with a DIY system, but there is a significant amount of manual control required. If you’re going to be away from your aquarium for a few days, you may run into problems maintaining appropriate carbon dioxide levels. You also don’t have the ability to completely fine tune your supplementing. The gold standard for supplementing carbon dioxide in planted tanks starts off with a full sized CO2 tank. These are available from resources such as welding and home brew supply stores and come in a range of sizes. Depending on the size of your tank, you may look for five, ten, or twenty pound canisters. To go with the CO2 tank, you will need a regulator, which reduces the pressure of the gas coming from the tank. These come in either single stage, which works in one step, or dual stage, which uses two steps to reduce this pressure. Because of their added complexity, dual stage regulators are considerably more expensive. However, they are also significantly safer for the overall health of your tank. Some single stage regulators, especially on the cheaper end, have a tendency to fail when the pressure inside of the tank drops below a certain point. When this happens, they have been known to “dump” the rest of the gas all at once. Unfortunately, this causes the carbon dioxide level in the aquarium to climb to the point of suffocating your fish. While this is not a guaranteed result of a single stage regulator, many will recommend going dual stage just to be safe. Most people will connect a solenoid to their regulator. Basically, a solenoid is an electronic valve that stays closed until it is powered. You can plug the solenoid in through a basic electric timer to have the air turn on and off on an automated schedule, which allows you to stop adding carbon dioxide at night when the plants are not using it anyway. Whether or not you use a solenoid, you will need a needle valve to fine tune how much gas flow you have. There’s a wide range of quality (and prices) of needle valves. You should try to avoid lower quality ones that are hard to precisely dial in. To measure how much air is coming through, you can use a bubble counter. Essentially, a bubble counter will connect either directly to the needle valve or along the air line and pass the gas through a portion of liquid. You can dial in the needle valve and count how many bubbles are getting passed through every second to precisely control how much carbon dioxide you are adding to your tank. A general rule of thumb is to start with one to two bubbles per second and adjust from there as needed. Finally, the carbon dioxide will go through the air tube to a diffuser. There are several different styles and materials of diffusers you can choose, including standard air stones (generally not the best choice), dedicated diffusers, and various devices that try to hold the carbon dioxide in the water for longer to try to give it more chance to dissolve into the water. The diffuser you choose will dictate what pressure your regulator should be set to. Generally speaking, the better diffusers will have smaller pores and make smaller bubbles, which creates more surface area and allows more carbon dioxide to diffuse into the water. Carbon dioxide is one of the three vital components to success in keeping a planted tank. When aquatic plants have used all of the available CO2 they are no longer able to utilize the available nutrients for growth. Algae, though, is much more adept at growing in low CO2 environments. When CO2 is the first factor to run out is when you start having problems with algae. Without achieving a proper balance between lights, nutrients, and CO2 there is no way to have a successful planted tank. That doesn’t mean that every planted tank must have CO2 supplementation, but many tanks will. Many problems that you may encounter, including algae breakouts and an overall lack of growth, can be completely fixed by adding carbon dioxide. However, there are also difficulties and risks involved when using carbon dioxide. It can take a different set of knowledge and understanding in order to successfully set up the entire system. It certainly adds a fair amount of cost to set up a decent quality pressurized CO2 system. And if you don’t have it set correctly, you do run the risk of suffocating your fish. But the potential benefits of carbon dioxide make overcoming these challenges well worth the effort.